Over at ace-education.co.uk, there’s a post entitled “10 Questions for Jonny Scaramana“. Here are my answers. Jonny Scaramanga is infamous for his anti ACE blogs. If you Google his name then you will find his Leaving Fundamentalism site and lots more info. I am responding to some of the false information given to the media ATM. Before we get going then, a question of my own: Please could you detail this false information? It would be useful for all sides, I think, to correct any misinformation that’s floating around. Until now, I’ve seen accusations of falsehoods flying around, but a shortage of specifics. It’s always nice to be talked about. It’s particularly lovely when you’ve been campaigning against an organisation for two years and their public strategy has been to pretend nothing is happening. Well, mostly anyway. But now Christian Education Europe’s Arthur Roderick has sent an email to CEE’s member schools discussing how they intend to deal with the menace that I present. It’s a fun read. Of course, Arthur doesn’t name me or link to any of the associated media coverage in his email. I presume he’d rather his customers didn’t read my blog. 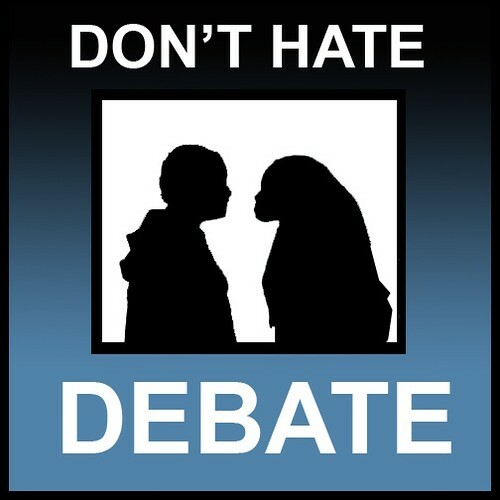 I, on the other hand, am all about the debate. I just think this is a conversation that needs to be had in public (not least because it’s one Arthur and other ACE teachers refused to have with me in private). In that spirit, you should also check out ace-education.co.uk, a new blog by Christine Bradshaw which attempts to debunk many claims I’ve made about ACE (and quite a few I haven’t). Replies to posts like these will come soon. I realise that my linking to them will probably triple the number of people who see them, but like I said, I welcome the debate. Something CEE does not, as I will explain shortly. Here’s Arthur’s letter. Since it’s online at a publicly available link, I have taken the liberty of reproducing it below. I know CEE are some of my most avid readers, so if they object, no doubt I will hear about it soon and have to replace the letter with a Jesus & Mo cartoon again. After the letter, I’ll tell you about some of my recent correspondence with Arthur and other people. I have a permanent running offer out to anyone who can offer a defence of Accelerated Christian Education: Submit it here, and I will post it on the blog. Well, the following comment got left recently in response to A Collection of ACE Survivor Stories, and I think it’s the best defence of ACE I’ve seen. I profoundly disagree with it, of course, but I am on holiday and don’t have time to explain why at the moment. So, readers, if you disagree, here’s your chance to respond: Leave your counterargument as a comment, and I’ll pick the best one on my return. I am on holiday, so this is a scheduled post. So behave yourself in the comments, because I’m not around to moderate. I recently had this great comment from an ex-ACE student who has since done a PhD in cultural anthropology. Their insights on ACE are lengthy but well worth reading. Unlike many of my guest posters (and me), Kachoukyori picks out positive parts from the ACE experience. This is something I’ll probably return to later. In order to understand why people turn to ACE, you need to understand what problems it is trying to solve. If you search Google Images for “cultural anthropology” and choose only images that are free to reuse, this is the first result. No, I don’t know either. This is a much-needed post, one I’ve circulated to friends over the years in trying to explain how global and curiously pervasive A.C.E. has become as a curriculum, adapting to shifts in contemporary fundamentalist culture, the growth of charismatic churches and aggressive right-wing politics linked to US hardline Christianity, and the anti-secular/social/government rise of homeschooling. My father was a US military officer; we moved constantly. From the pre-K on I was enrolled in Baptist schools, by the 3rd grade I was placed in a school that used the ACE curriculum. I never experienced US public schools and was immersed in two peculiarly isolationist cultures: fundamentalist Christians and US military bases. What a combination, indeed! The Bible and the Sword. There seems to be a bit of a disparity between the facts and what some ACE teachers say. In this, my triumphant return to vlogging, I talk about Brenda Lewis, who seems incapable of getting her facts right when she talks in public. 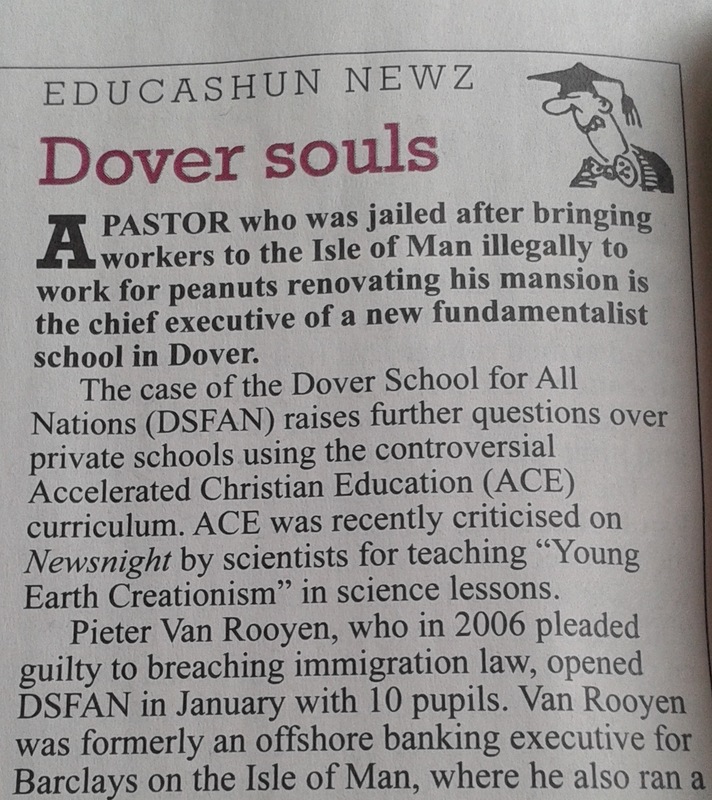 From Private Eye issue 1369, 27 June – 10 July 2014. What Private Eye didn’t report—and I can exclusively reveal—is that in addition to being a criminal, Van Rooyen is also a conspiracy nut and a plagiarist.